The large number of carvings recovered from the Dorset culture provide a rare insight into the religion and worldview of an ancient hunting people. The relationship between humans and animals seems to have been a central concern of the Dorset people. Human life depended on taking the lives of animals, and this act was accomplished by a combination of luck, skill, and the willingness to confront both physical and spiritual danger. The carvings found at Dorset sites suggest that their owners, like all other northern hunting peoples, practised a shamanistic religion in which all living creatures had human and animal, spiritual and physical qualities, in much the same way traditional Christian thought portrays a human being as a combination of a corporeal body and a spiritual soul. Unlike Christian belief, however, shamanistic belief does not exclude animals from the world of the spirits. Animals have souls, can become ghosts, and can manifest themselves as spiritual beings. Shamanistic thought postulates a distant past when there was no difference between humans and animals, when they could talk to one another and even transform themselves from animal to human form at will. These transformations and communications are thought to also occur under special circumstances, such as in a dream, or when a human soul journeys to one of the other planes of existence above or below the earth, where the animals live as humans do on the earth's surface. If Dorset thought was similar to that of other shamanistic peoples, Dorset people must have believed that a human's powers could be increased by incorporating the strength and energy of "helping spirits." Such spirits could be encountered in dreams, through a deliberately induced trance or, occasionally, while hunting or travelling alone on the tundra. Most helping spirits took the shape of animals, and each had specific powers related to the abilities of its animal form: strength, swiftness, keen vision or subtle cleverness. Through a spiritual helper, people could survive dangerous situations, and increase their ability and luck at hunting and other activities. A large proportion of Dorset carvings represent the polar bear and the falcon, the consummate hunters of the Arctic world. Most of the carvings are perforated for attachment to a cord, and they may have been worn as personal amulets. It seems likely that these carvings did not depict real animals, but rather animal-spirits that helped hunters in pursuit of game. This interpretation is suggested by markings on the backs and sides of many carvings, which represent the skeleton seen through the body. In shamanistic thought, the skeleton symbolizes the soul, as both outlast the soft flesh of the body. Some of the carvings of animals are hollowed out on the underside, again appearing to depict a de-fleshed form, suggesting that the creatures have been divested of their earthly bodies. Spirit-bears are most often depicted in a floating or flying posture, quite different from the walking or swimming postures of real bears. The carving highlighted in this room - a falcon with the head of a bear - is unique. This creature, combining the power of the bear with the swiftness and striking ability of the falcon, must have been an especially powerful amulet. Another form of magical activity is suggested by some of the other carvings, which have a hole gouged in either the throat or the chest, sometimes containing a small wooden stake. These animal depictions may have been ritually "killed," perhaps as a prelude to a hunt for the real animal represented by the carving. The Dorset people also tried to imbue their hunting weapons with magical qualities. This is most clearly seen in the heads for their harpoons, which were designed to strike sea mammals and hold them with a line attached to the harpoon head. 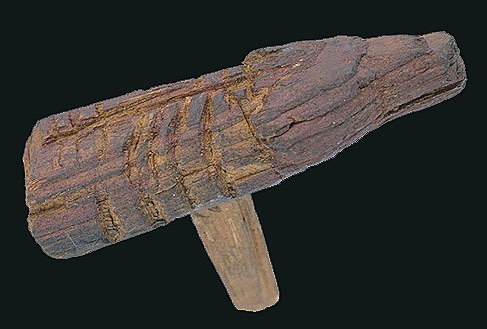 The general form of some harpoon heads resembles the carvings of falcons and floating or flying bears. The lines and the human-like faces found on some of them may represent the faces of helping spirits. Miniature harpoon heads, as well as miniature versions of other weapons, are often found in Dorset sites. These are exact replicas of the harpoon heads used by Dorset hunters, and they may have been used in some form of hunting magic. Another form of decoration appears only on the large ivory harpoon heads that were apparently used to hunt walrus. Small combinations of scratched lines on these artifacts do not seem to have had magical significance; they were probably individual ownership marks. In a communal walrus hunt, hunters could use these marks to document their strikes and take their appropriate share of the glory and the meat resulting from a kill.